I believe SSH access is extremely important when managing a website. I always use the SSH access to directly access my website files. I find the FTP solution too slow because if I have to make a change to a file, I have to download the file, make a change and then upload it back up. With SSH I can directly change the file on the server without all the upload and download procedure. If you are not a seasoned SSH user, then FTP is the best solution. But for me, SSH access is a MUST. So I always change my users to have SSH access. Below is a tutorial on how to allow your users SSH access to your website. 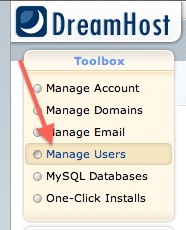 Login to your Dreamhost account to edit your user. You can create unlimited number of users to access your account. Typically you will have a different user name for ftp, ssh, and if you have multiple people managing your site. You can create different accounts for each so you can control what access they can have. Scroll down where you can see the list of users that you created to manage your website. 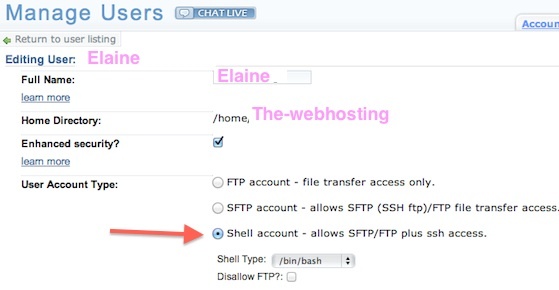 Changing the user account type to a shell account will allow the user to have SFTP/FTP plus ssh access. You have an option to deny the user FTP access. After you make the change, it will take about 10 minutes for the changes to replicate through the system. You can then use SSH to connect to your website.